Strawberry and Kiwi always seem like a good pairing to me. So when I made these delicious Kiwi Cupcakes, I knew the exact frosting I wanted to put on top. Strawberry Cream Cheese frosting might not seem too radical, but wait until you see how this one is made – it is easy as can be. I love kiwifruit, scooping it out of its little skin like an egg. Its unique flavour works really well in these cupcakes and tastes very fresh and light. 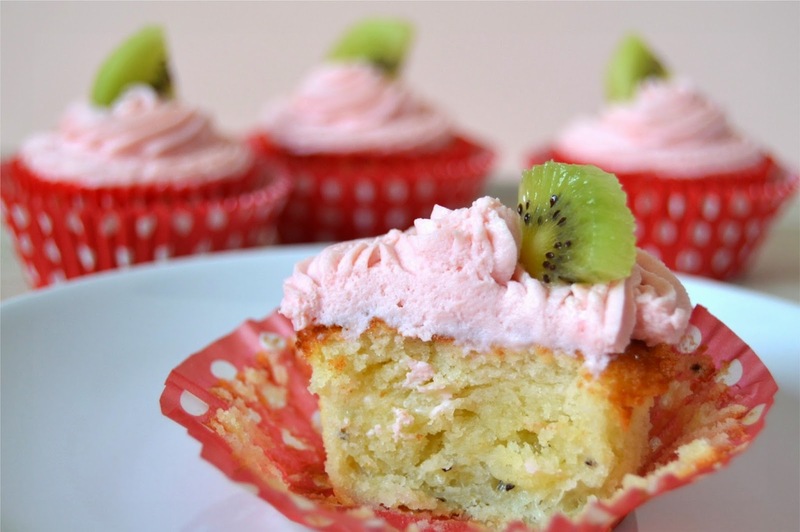 It just takes a couple of very ripe, mashed up kiwifruit to pop into the cupcake batter. The little black seeds are flecked through the baked result which is delicious. On to that Strawberry Cream Cheese Frosting. Why I am I so excited about it? It only takes a tub of cream cheese (light versions are fine) a packet of pudding mix such as Angel Delight and some milk. That’s it. Pop the ingredients in a mixer and then into a piping bag (it’s too thick to spread) pipe the mix on to cupcakes and you are done. Easy. Plus, you could totally change the flavour depending on what pudding mix you buy – chocolate, butterscotch, banana?! The frosting holds up well for a few days too, if kept in the fridge. Preheat the oven to 180C. Place 12 cupcake liners in a cupcake tray. In a small bowl mash the kiwifruit with a fork. Get it as smooth as possible. Sift together the flour, baking powder and salt in a bowl and set aside. In a separate bowl mix together the milk, kiwifruit and vanilla. In a mixer blend together the butter and sugar until light and creamy. Add the egg and egg whites and beat until combined. Add one third of the four mix and blend in. Add one half of the kiwi mix and blend in. Repeat with flour, kiwi and lastly flour. Scoop the batter into the cupcake liners and bake in the oven for 15 minutes or so. They will have turned golden brown and a toothpick will come out clean from the centre. Allow them to cool completely before adding the frosting. To make the frosting cream the cream cheese in a mixer with the beater attachment (not the whisk). Add the pudding mix and 2 tablespoons of milk. Beat until the mixture is smooth. If it seems a little tight, add more milk until it loosens to a pipe-able consistency. Transfer the frosting to a disposable piping bag with a nozzle of your choice and pipe onto each cupcake. Decorate the tops with a little wedge of kiwifruit and that’s it. Light, fruity and fluffy these cupcakes will delight kids and grown-up kids alike! And if you have any leftover kiwifruit why not give Helen, at Fuss Free Flavour's pavlova recipe a try? I am entering these Kiwi Cupcakes into October's Alphabakes hosted alternately by Caroline at Caroline Makes and this month Ros at The More Than Occasional Baker. The letter this month is K, so these fit the bill perfectly. Those look rather exciting Stuart & I love your idea for the frosting. I love these cupcakes look beautiful. What a great, recipe for strawberry frosting Stuart- I love he simplicity and am very partial to a pack or two of Angel Delight ina retro-treat kinda fashion! Seriously - I had to sign a form which means I can't discuss it!! But I can say it was fun and nerve-racking! Adding kiwi fruit to the cake batter is genius and serious cook that I am, I cannot resist Angel Delight! Lovely combination and lovely cupcakes. Thanks Choclette - I think the Angel Delight move was a genius move too lol! Hmm, what an interesting flavour combo! but I love strawberry and kiwi so I'm sure it would be delicious! love the colour contrast with the kiwi on top too! Cheers Gem. The two do marry up very well together! Serious cupcakes! Kiwi is inspired. And yes it is a perfect match with strawberry. Love the photos too! Thanks Kate - loving my new camera! Angel Delight? I wouldn't have believed it if anyone less reliable would have told me. Sounds delicious. Come to think of it, Angel Delight and kiwi fruit seems to sum up the food of the early 1980s to me. You must have had a very exotic early 80's sir! 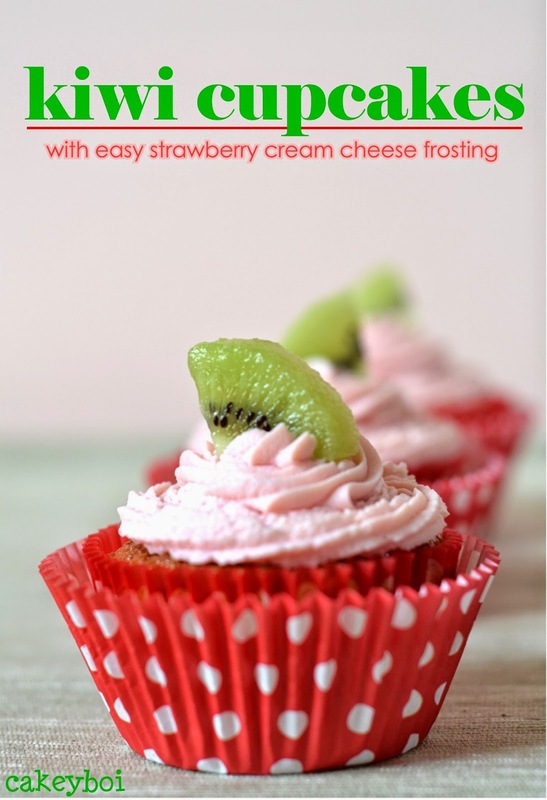 I love the combination of kiwi and strawberry and that really is an easy frosting. Thanks for entering AlphaBakes.